The Little Black Dress has been a staple in most women’s wardrobes forever. It’s right for so many occasions. Whether it be work attire, a relaxed night out or something more fancy, the LBD has you covered. 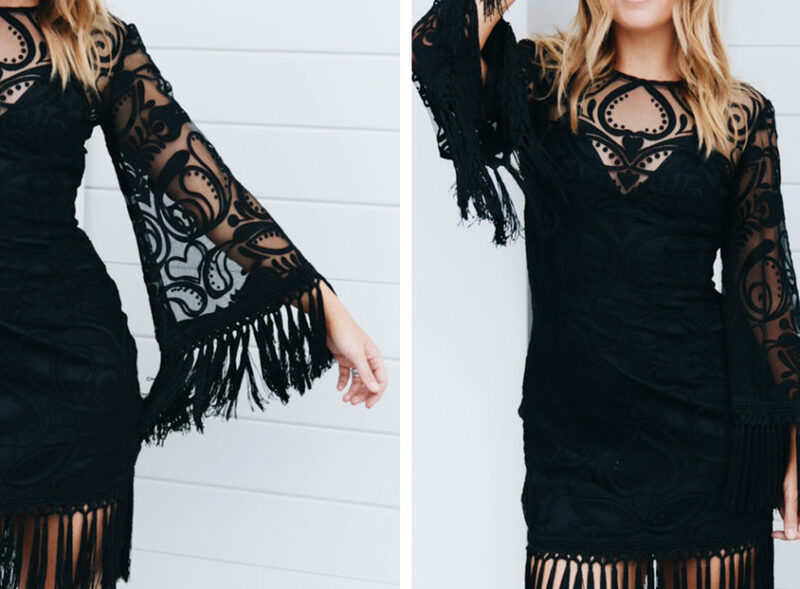 I’m loving the tassels and the lace details on this dress. It gives the dress another dimension. It turns a simple LBD into something more interesting. Just like this dress, life is full of texture, intricacy and layers. Sometimes the simplest things can get complicated. Over thinking, insecurities and comparison play a big part in clouding an otherwise clear track. There can be real beauty in the layers of life, but it’s finding the balance that’s the challenge. Here are a few ideas on how we can find the balance between simple and complicated. Be kind. Maybe it goes without saying, because I’m always banging on about kindness, but the one mantra I hold dear to is being kind to others. There’s something very powerful about approaching every situation with kindness in your heart. It changes the way you view people and how you interact with them. Spread some kindness today, watch what happens. Be yourself. We’re all guilty of doing things to please others and in the process we can lose who we really are. Comparison seems to be a normal why of living these days. Social media, television, magazines and I’ll say it – even being a mum, brings us opportunities to try and be, look and act like somebody else! Being true to yourself takes inner strength and determination. Start by defining the qualities you want your life to reflect and take the steps to ensure you align your life to these values. You are actually wonderful and perfect just the way you are. There can be real beauty in the layers of life, but it’s finding the balance that’s the challenge. Be honest. Oh so scary! Being honest is not always as easy as it sounds right?! Sometimes having a good old heart to heart with someone and sharing your feelings or being vulnerable can be terrifying. Even harder can be those moments of confrontation where you have to have an honest chat with someone about something that is failing in your relationship or work place. Those moments are painful at the time (cause who wants anything bad pointed out about themselves!) but are some of the most rewarding conversations. It gives you (or somebody else) an opportunity to reflect, and change. I find being honest with myself can be quite brave too. Really taking a step back and seeing if I am making the right decisions or treating people in the right way is really good for me. Tough, but good. If you need to be honest with someone or yourself try approaching the conversation surrounded with love. Attacking or being defensive will only prolong the outcome. When any conversation is approached with love, the outcome is mostly positive! Peel back the layers. People are made up of so many layers just from living their lives. We have all come from different backgrounds, families and upbringings. Everyone has a different story and path that has brought them to where they are. Layers protect us. They make things look fancy from the outside and give us the chance to block out the real deal sometimes. Things can get complicated when you’re trying to be something you’re not. Make a decision to keep it real and peel back the layers to expose who you really are. I’d love to hear your thoughts about how you balance life’s complexities in an effort to keep things simple. Leave a comment below. Keep spreading the kindness!